Truly outstanding and stylish show home featured in several magazines including Architectural Digest and Veranda. Situated on a quiet court in prestigious Joshua Creek! Backing onto densely wooded ravine. From the moment you step through the front door you truly get a better understanding of the uniqueness and quality of the finishes offered here. Offering 4,683 sq ft above grade, this remarkable home features 10’ ceilings on the main level as well as 9’ ceilings on the upper and lower levels. The front foyer features ¾” Crema Marfil marble flooring cut from full slabs, plaster moldings on the walls and ceilings plus double stepped drywall detail which continues throughout the entire main and second floors. To the left sits the main floor study offering 20’ ceilings, Downsview Custom Cabinetry, inlayed leather panelled walls and ceilings, open riser solid wood spiral staircase to upper level study and custom silk drapery. The Custom Premium Collection kitchen by Downsview Kitchens is loaded with top of the line appliances (Wolf, Subzero, Meile) and features Calacatta marble countertop, stainless steel drawer fronts, rolling ladder to allow access to upper cabinets, soft close drawers and ample storage space. It also features a custom built in breakfast area with circular banquette which is without a doubt the heart and soul of the home. A sun filled family room offering an abundance of windows, finished on site walnut hardwood floors, custom silk draperies, remote controlled blinds and a town and country natural gas fireplace with custom limestone mantle adjoins the kitchen making it the perfect entertaining area for guests. The formal dining room features finished on site walnut floors laid in a herringbone pattern and wenge inlay boarder, custom plaster wall paneling as well as plaster crown moldings and double stepped drywall ceiling details, and a town and country gas fireplace with marble surround. Three sets of French doors allow access to rear covered porch. The second level is home to four bedrooms each featuring ensuite access. 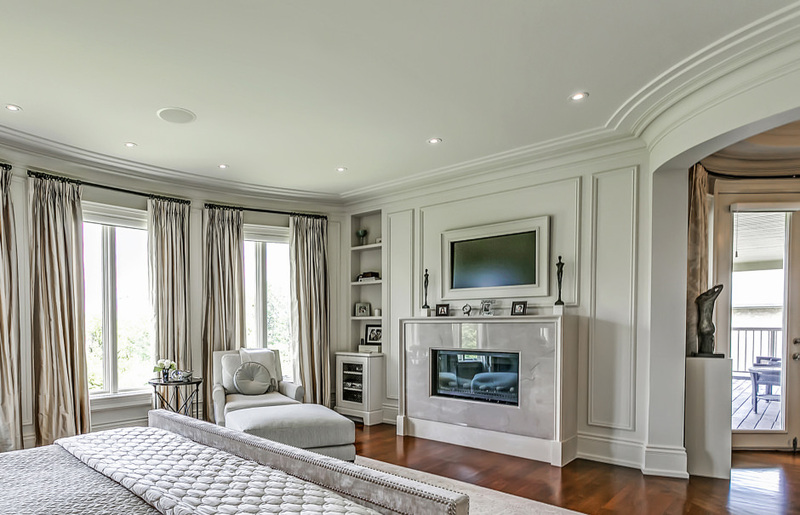 The very spacious and luxurious master suite takes up the entire back section of the home offering lush ravine views. It is comprised of a spacious bedroom area with natural gas fireplace, custom silk panelled and mirrored walls, custom silk draperies, custom audio cabinet and has access to a private covered porch. The master suite is also home to a large dressing room for her with custom Downsview cabinetry as well as an additional walk in closet for him. The gorgeous ensuite bath features book matched marble surround, custom walnut cabinetry, Calacatta marble counter tops, separate water closet, seamless glass walk in shower with rain head and body sprays and an oversized air jet tub. The lower level of the home features an additional 2,124 sq ft of finished living space. It includes a 5th bedroom with ensuite access as well as a large recreation room with a custom built in bar area, a home gym with rubber flooring, and a theater/family area featuring custom cabinets with seating areas, natural gas fireplace with cast limestone mantle, leather walls with stub detailing, remote controlled blinds and an over head projector. The home also features an oversized heated garage fully finished with epoxy floors and built in cabinets, 8’ solid core doors, custom iron railings, solid brass hardware, a main floor powder room with leather wrapped walls and state-of-the art home automation for exterior security cameras, multi room stereo speakers and lighting controls. Located in prestigious Oakville Ontario this home is within close proximity to great schools both private and public. It also allows for easy access to major hwy’s, parks and shopping. Perfect for the growing family who demands nothing but the best.